In 1954, in a landmark unanimous decision, the United States Supreme Court in the Brown v. Board decision ruled that the American system of state-sponsored segregation, which had been in place since the 1896 Plessy v. Ferguson decision, was unconstitutional and inherently unequal. One year later, the Court ruled that integration had to occur within all public schools “with all deliberate speed.” The ambiguous language used in the Brown II ruling was seen by many to be a victory for white southerners as it did not force them to integrate by a certain date. As a result, integration was a slow and difficult process. Since the Supreme Court does not have the ability or the right to enforce the law, black and white southerners quickly found that progress would not peacefully occur without the direct intervention and assistance of the executive branch. During that time, the struggle for civil rights was a legal issue that was being defined by the American Courts but not translating into real change in the lives of its citizens. This decision unofficially marked the beginning of the modern Civil Rights Movement, which was a period of tremendous growth and change in the political, social, and economic landscape of our country. Similar to the Reconstruction Era, this period fundamentally changed the everyday lives and experiences of black Americans. With the Brown II decision and the reaction to it, it was obvious that real progress would not occur unless there was a direct, sustained, and organized plan to confront and fight Jim Crow state by state. Civil Rights leaders and foot soldiers began to organize and change started to happen: the Montgomery Bus Boycott started in 1955; Little Rock Nine integrated in 1957, the Sit-In Movement began in North Carolina in 1960; the CORE Freedom Rides started in 1961; and, James Meredith confronted the University of Mississippi in 1962. At the same time, the push to stop the slow march of freedom and integration intensified as the police, acting in concert with white southerner politicians, used a number of fear tactics, including mass arrests, aggressive attack dogs, water hoses, and lynching. This was the environment, the one where the goal of freedom and equality for black people was being challenged over and over again, that existed when Governor George Wallace announced in his 1963 inaugural address that in the state of Alabama segregation would continue to exist today, tomorrow and forever. On June 11, as two black students prepared to enter in and desegregate the University of Alabama, Wallace in is now famous “Stand in the Schoolhouse Door,” attempted to physically block them. Even though they were peacefully admitted, it was was only because President John F. Kennedy had sent the Alabama National Guard to enforce the law. Later that day, in a live radio and television broadcast, Kennedy called on all Americans to recognize that the struggle for civil rights was a moral cause that everyone needed to not only contribute to it but be committed to it, as well. He proposed the Civil Rights Act as the means in which to bring about the change that needed to happen to free African Americans from “the bonds of injustice” so that they will finally be “fully free.” Although Kennedy was assassinated seven months later, this legislation, that abolished discrimination in public accommodations, employment, and federally funded programs, was pushed through by President Lyndon B. Johnson and became known as the 1964 Civil Rights Act. 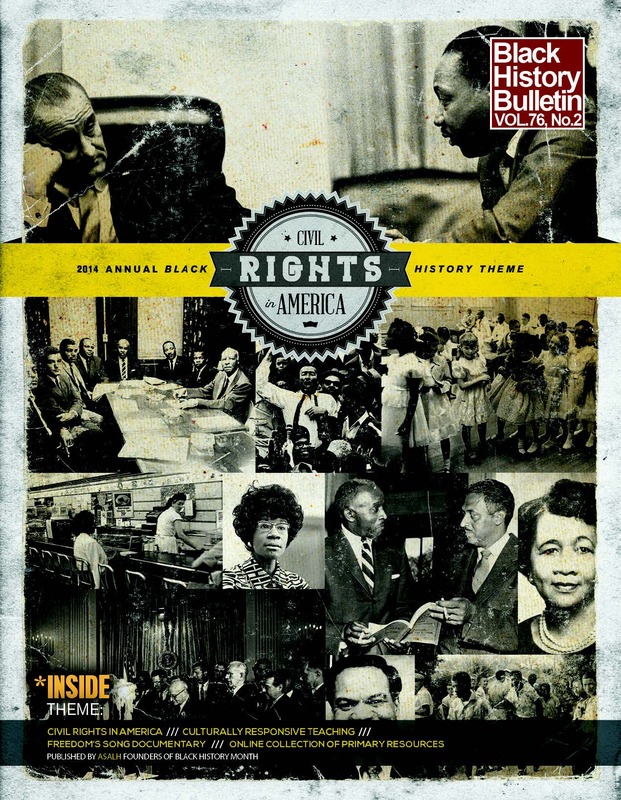 This issue of the Black History Bulletin called for papers that would use the lens of the 1964 Civil Rights Act to examine key moments that took place either during the modern Civil Rights Movement or during the early Civil Rights Movement (which occurred during the enslavement and Reconstruction). The 1964 Act is an incredibly complex piece of legislation to teach in the classroom as students need to have some understanding of some of the key events that were taking place that led to Kennedy’s address. They also need to understand that though the struggle for civil rights and social justice did not begin or end with the modern Civil Rights Movement, this period of time was when our nation began to shift from being two societies, “one black, one white—separate and unequal,” to being one society with freedom and justice for all. Abel and Johnson, in their article “The African American Sage from Enslavement to Life in a Color Blind Society: or Racism without Race,” takes a slightly different approach in helping students to reframe the historical narrative. They divide the Civil Rights Movement into two parts, the first from 1865 to 1877 and the second from 1954 to 1965, and then provide a historical context so that students can understand how these two Movements were and are connected. In their lesson plan, students have an opportunity to “pull the history forward” as they examine primary and secondary sources to better understand the voting controversy and subsequent succession efforts surrounding the 2012 presidential election. Since Abel and Johnson’s article explores both the modern and the historical Civil Rights Movement and the Gist and Whitehead article only focuses on the modern, the Garrett-Scott article, “‘When Peace Come’: Teaching the Significance of Juneteenth,” provides a nice complement by providing a close examination of enslavement and Juneteenth. In it, the author explains that for students to clearly understand the significance of the 1964 Civil Rights Act, they must first understand some of the smaller historical moments that set the stage for the legislation. One such moment was the Juneteenth event, which is used as a starting point to help students to explore and understand the lived reality of Americans of all races and ethnicities. In the lesson plan, the author, in partnership with two practitioners, provides three lessons where students examine the Emancipation Proclamation and Juneteenth to understand the process of freedom in social, political, economic, and cultural contexts from the 1860s to the present. The final article, “Understanding the Local Context of the Civil Rights Movement: Using Service Learning to Develop an Oral History of Our Community,” is actually a first person essay that discusses the author’s childhood experiences in Detroit of learning about the Civil Rights Movement from people who had either participated in it or benefitted from it. Using his life as a starting point, Simmons discusses how he works with teachers and students to create oral history projects that focus on local communities. He stresses the importance of partnering with the community to expose the students to living legacies. In his lesson plan, he provides a detail guideline for how teachers can teach their students how to collect, store, and analyze first person narratives. Each of these articles and lesson plans, either taken individually or collectively, will provide both researchers and teachers with a broad understanding of the 1964 Civil Rights Act and some of the key historical moments that paved the way for the passage of this legislation. Finally, as we celebrate the golden Jubilee of the Act, it is important that we move forward—as teachers, researchers, and students of history—like Sankofa birds. We fly forward into this future that we are creating and making up along the way; and, we keep our eyes on the past so that we do not repeat the mistakes and we learn the lessons. These articles and lesson plans are designed to do both, provide us with an understanding of key historical moments as well as offer us new ways to teach and understand these moments. As is the case in everyday life, the terms black and African American will be used interchangeably in this article.